Artful Affirmations: Tea Cup Tuesday Easter Tea and Swap! 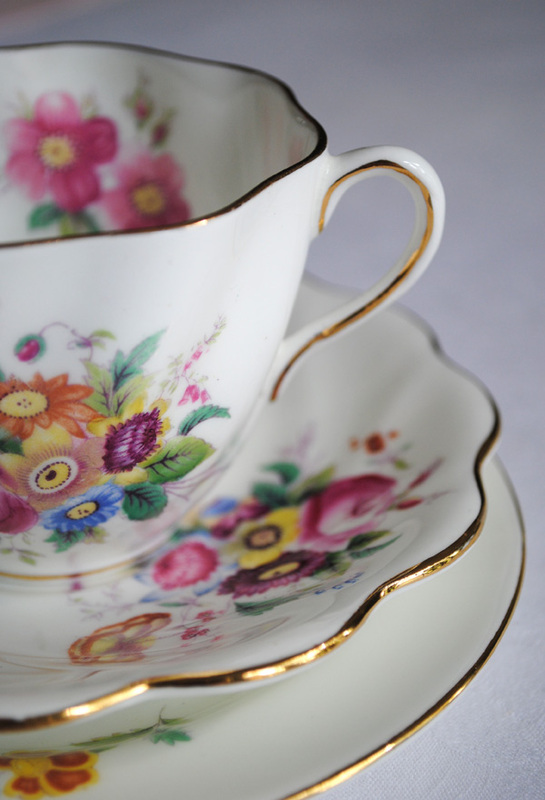 What a fun, cheerful tea cup! Love the spring flowers!! Oh what gorgeous stuff!! Everything is lovely!! Thank you so much for sponsoring the teacup exchange. It has been so much fun! 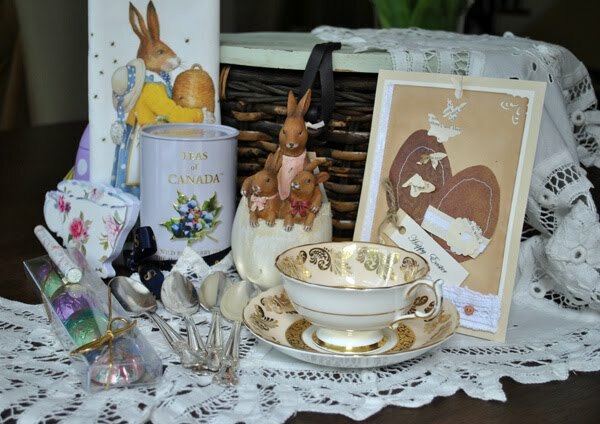 Thank you so much for organizing the Easter Tea Cup Swap . I was existed to create this basket . Such beautiful cups and thoughtful goodies. I am just dazzled! You really did a wonderful job creating a swap and I am amazed that you are in two others. I think swaps are wonderful, though. Like Christmas! I would say that you a very blessed! I cannot wait to see all the other special treasures you have received!! The cup our dear Martha gifted you with is so magnificent - I just love the detail! I think patterns on the inside of the cups are so beautiful. Enjoy all your prizes! Thank you for hosting our tea party and swap! Everything looks lovely - hope you enjoyed all that chocolate! to see your and Martha's Easter swap gives a good idea of your blessed friendship. Both of you know so well what makes the other one happy. 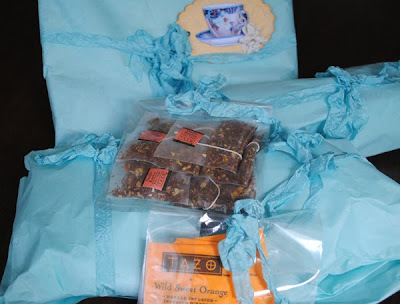 Great swap, I am sure you both will enjoy your precious gifts. Wish you a blessed time. Thank you so much for hosting this charming event. Beautiful cups and gifts! Makes me want to get out all of my pretty things, too! What joy you must have had in receiving and opening the beautiful packages. The treasures inside are wonderful!The teacup from Martha is everything one would expect from a lady who knows her teacups and how to pick just the right one. Your table setting is very pretty and I like the idea of a small gift by each place setting. The tea cup that Martha sent you is truly special. It sounds like you had a wonderful Easter. Thank you for a lovely party. Hi Terri...gorgeous cups..yay..such dazzling treasures..everything is super beautiful! Enjoy! Happy Easter..wishing you many blessings always! I love your place setting with that beautiful soft pink dinner plate, salad plate and gorgeous tea cup, my very fav! I also love your gift from Martha, you very fortunate! The flowers evoke spring n the air...I adore cups with flowers, so pretty! Thanks for comming by and leaving me such lovely comments and thank you for hosting too. I love your teacup tuesdayposts! The cups are all so beautifull! It looks like the easterswap was a lot of fun! 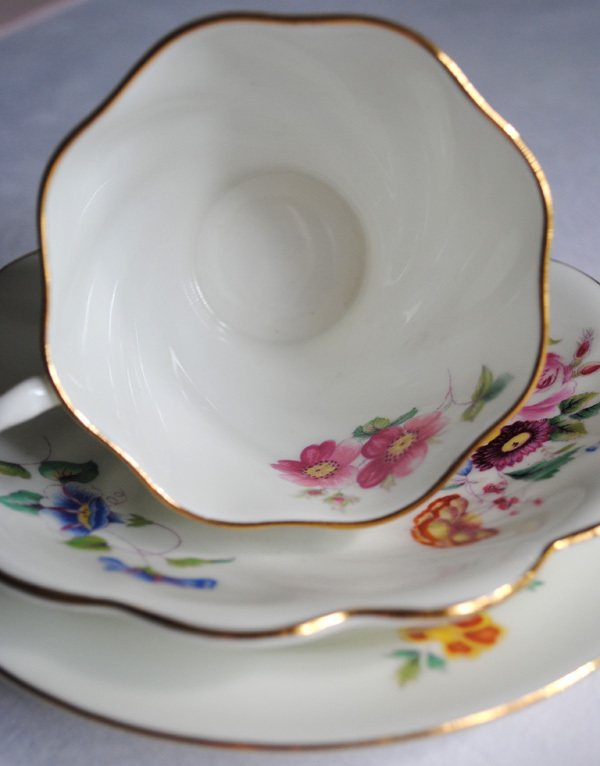 The Coalport trio you got from Martha is just gorgeous! How lucky you are for being such good friends! Thanks for hosting again and for showing all these beauties. I love the chocolate bunny to start with and all your goodies from the swap. ... then the lovely cup from Martha! You hit the jackpot!!!! happy tea day! Oh what a beautiful Easter tea. Looks like such a good time. We had more of the frenzied getting ready for church and home for dinner and egg hunt with my girls. Good times though, just different. :) I love looking at all your swaps. I so wanted to play in your cup swap, but I thought being a newbie to cup swaps I should try our Marie one first. I can't wait to do another one. Have a wonderful week. What a wonderful array of gifts you have received! 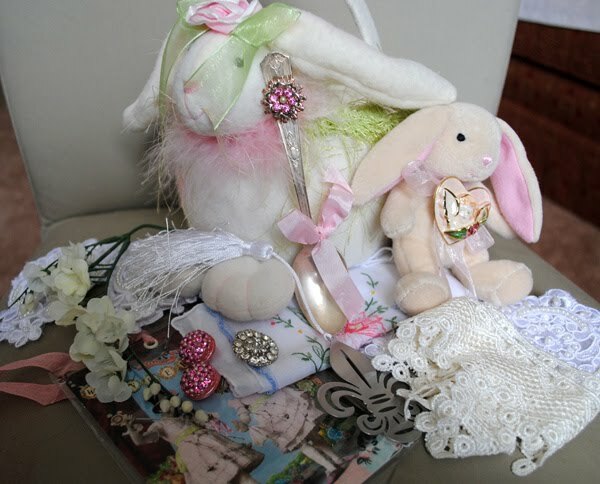 That bunny basket from Martha is adorable and the trio is lovely! How blessed you are! Thanks for sharing all your wonderful goodies and have a delightful day. I loved the teacup Martha gave you! So beautiful! What a good friend she must be. This week I almost couldn't join the Teacup Tuesday. Lots and lots of problems to solve populating my head. 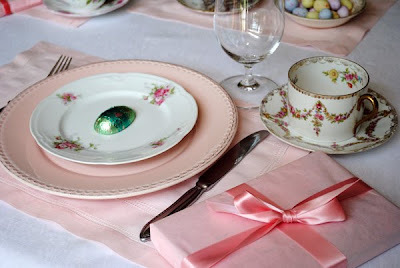 Hi Terri, Your Easter setting is so beautiful with the Bunny and Eggs. 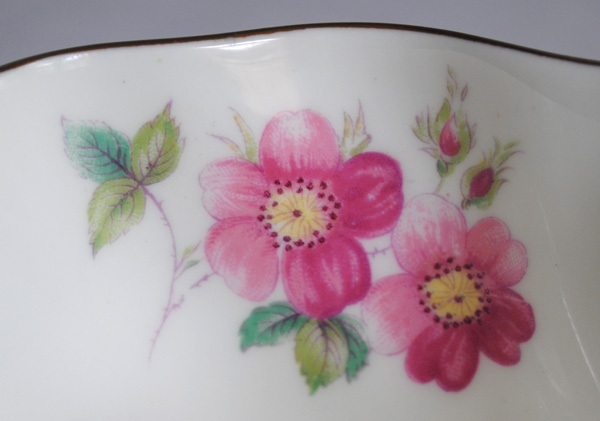 What a Gorgeous teacup and so Spring! thanks for sharing. Wow, what beautiful treasures! That teacup from Martha is gorgeous! I can't wait to see more of your beautiful gifts next week! Love the blog, I am new to tea blogging and have found such beauty in all I see here and other wonderful sites linked up here. I included a link on my site. Thank you! oh wow! what a wonderful easter bunny basket swap you got! 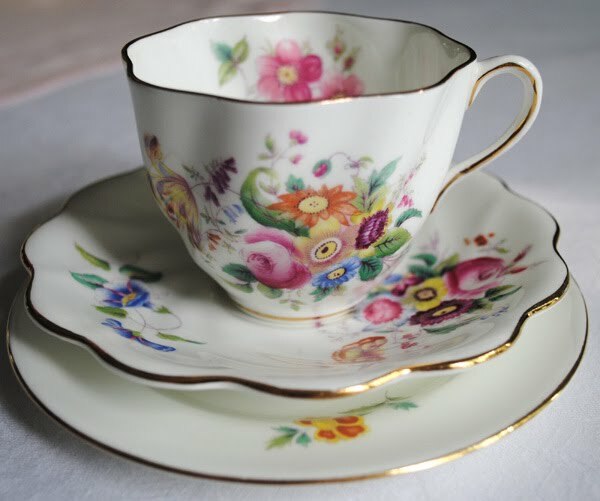 love the teacup, the design is so gorgeous!! 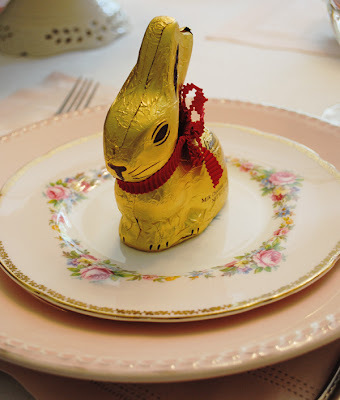 love your easter table setting too!! thanks for hosting tea time tuesday! 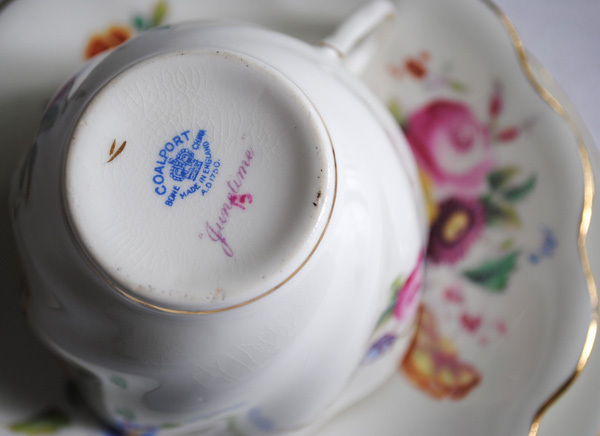 You are lucky,Martha has always lovely tea cups and now you have got one of them! Hi Terri! It sounds like the teacup swap was so fun..too bad I just joined..next year! You cup is beautiful. I love the thought that the cups travel around. lol I had a choco bunny just like the one in your pic..on the way home from the store,I ate him. :o See you next week. Your blog i so pretty! What lovely teacups - I thought I had signed up for this, but maybe not!!! I will have to catch you next time around. Your Easter table is gorgeous!!! Lovely Teacup Swap. Your Easter gifts are so thoughtful and I love the bunny basket. The table setting is very lovely too. Thanks for hosting. Thank you so much for your warm comment on my blog! Terri, it sounds like you had a wonderful Easter. Your Easter gifts look beutiful and i can imagine how special it felt to receive them. The cup from Martha is a real treasure. Such a beautiful pattern full of bright flowers, just perfect. These are quite lovely swaps - they outdid themselves - so many beautiful treasures - so glad you had a wonderful Easter with your family - it is a blessing to spend time with them when you can as they grow! Such a lovely post dear one! Sending joy to you and blessings, too! I love your Coalport trio. I have always loved the Coalport China for it's beautiful designs and quality. Glad the swaps were fun! I don't think I've seen a chaocolate bunny look so delish! Sitting there on your pretty(gorgeous) china plate. Beautiful sway gifts. WHat fun that must be to unwrap all those goodies. I love your art Terri. You have incredible talent in so many forms.